Question: You started Cyprus Partners. Why? Brickman: A big lesson I learned working with southern landowners (and being one too) is that many have deep emotional ties to their land. We tend to take it personally. Great granddad bought it in1885, or here is the spot where dad asked mom to marry him. On top of this, most landowners are not familiar with the business end of it . . . which trees to cut, when, what they’re worth, how to sell a piece of land, and so on. For many, it’s hard to get past all this and be confident they’ll make a decision they can look back on 10 years later and still feel good about it. Landowners tell us they need someone they can just talk to who knows the markets and the biology, etc., who will also take the time to understand their vision. It starts with seeing the ‘picture’ in their mind of how the land and family fit together in 10 years or so, and exploring the options for getting there. Many don’t realize there are always options. Of course, every option has a ‘price tag’. Not necessarily in terms of money, but in terms of consequences to the kids, taxes, value in 20 years, their hunting or fishing experience, etc. We help landowners understand the options before they make a decision. I started Land Smart Resources as a place where landowners can go to see how everything fits together. You know, where they can get specialized professional resources concerning real estate, forestry, wildlife, taxes, legal, etc.) in one place. Question: But, you aren’t an expert in all those things – legal, tax wildlife, etc. So how does it work? Brickman: Think of Land Smart Resources as the general contractor on a house. The General Contractor isn’t a plumber, or electrician, but he knows the good ones and cultivates close working relationships with them. We’re the same thing. There are professionals in many disciplines that have specialized knowledge as relates to landowners. So, we seek out these relationships. This way a landowner can make better decisions by looking at things from many points of view. Question: This sounds complicated. Can you give an example? Brickman: Actually, it’s pretty simple. Suppose a landowner wanted to sell a 200 acre property that doesn’t have legal access. By working with a realtor that specializes in rural land, the landowner discovers that land without legal access sells at a serious discount. And by talking to a tax specialist, they learn that almost 80% of the sale would be subject to capital gains tax. So, before going to market the landowner decides to negotiate a written, legal easement to the property, and decides to sell taking advantage of Section 1031 of the tax code (tax free exchange). A scenario like this could earn the landowner many 10’s of thousands of additional dollars. In this case, specialist in real estate, tax and law were brought to bear on one decision and the landowner saw a ‘bigger picture’ and made a better decision for his family. Question: So, Land Smart Resources is a collection of companies? Brickman: That’s right. We work with an attorney who is also a forester and timberland owner. He has years of experience and specialized legal knowledge regarding land and land ownership. We work with a biologist that specializes in fisheries & lake management. 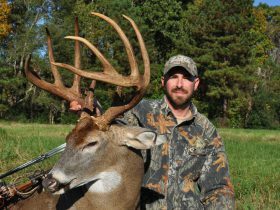 We work with a biologist that specializes in deer and turkey management who helps our clients create an enjoyable hunting experience. My wife is a CPA in private practice who understands landowners and their special tax needs. Question: Cyprus Partners and South40 Partners are on your newsletter. Who are they? Brickman: These are two of the companies that give our clients specialized know-how. Cyprus Partners is a real estate company that helps people buy and sell rural land. One of their strengths is an internet marketing program (6 web sites and a monthly newsletter to 20,000) that shortens sale time and gets more money by going to a very large audience. 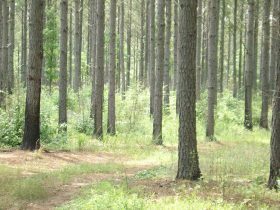 South40 Partners is a forestry consulting company that helps people care for their land and timber. Their clients report they get as much as 100% more money for timber sales through a sealed-bid sale process that invites about 100 timber buyers to compete for the timber, not just 2 or 3 like many landowners do. Question: How did you get into the rural land business? Brickman: Well, I’ve been in the woods all my life. My dad was a forester working with private landowners, and as a boy I spent many years following him through the woods helping to find corners, cruise timber, and listening to Alabama landowners. I guess it’s in my blood. Then I went to Forestry school at Auburn University and for the last 34 years have worked with private landowners. Question: What else have you done in your career? Brickman: As a young man I had the tremendous opportunity to work for Resource Management Service, one of the largest and oldest forestry consulting forestry companies in the country. I look back at the opportunities they gave us and I’m still amazed at the scale and variety. We cruised the timber on 1.5 million acres at one time, bought over 1million acres for investors and paper companies, sold about 100,000 acres in hundreds of transactions, appraised many properties over 100,000 acres in size. For a young kid who loved the woods, this was experience most could only dream about. I feel very grateful for the time I had there. Editor’s Note: Tom Brickman is a licensed Real Estate Broker, Registered Forester, Certified General Appraiser, rural land owner and founder of Land Smart Resources. The company serves people who want to buy, sell or manage rural land, and their mission is helping people make smart decisions about rural land.